PHUKET: In her last act as Director of Phuket International Airport, Monrudee Gettuphan yesterday (June 4) visited the passenger in hospital who suffered head injuries in a ceiling collapse at the airport’s Domestic Terminal on Saturday (June 3). 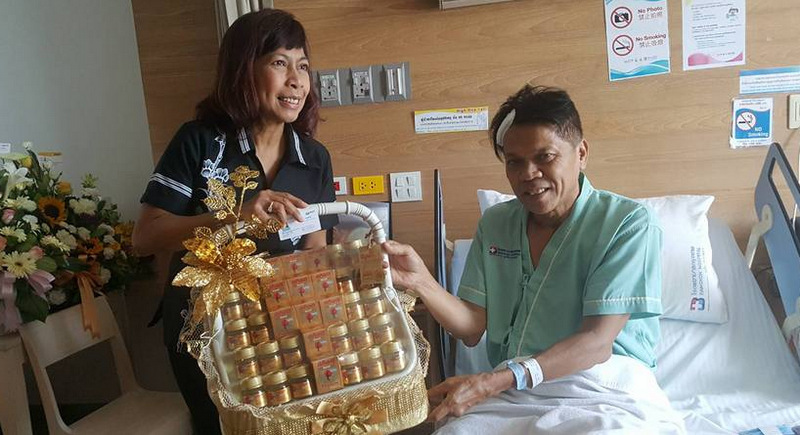 Mr Buncha was initially taken to Thalang Hospital, but later transferred to Bangkok Hospital Phuket, where Ms Monrudee and other senior members of Phuket Airport management yesterday assured him that Airports of Thailand (AoT) will pay for his medical expenses. AoT, which operates Thailand’s six main international airports, had already arranged for a full refund on his flight ticket. “Phuket International Airport’s insurance provider will take care of all medical expenses for the passenger,” one AoT representative from Phuket Airport told The Phuket News. Ms Monrudee declined to comment about her transfer to the position of Senior Executive Vice President of Airport and Aviation Standards, effective today (June 5). “I moved to Bangkok today. Please ask the new (Phuket Airport) director,” was all she would say. Phet Chan-charoen, General Manager of Don Mueang International Airport, will arrive on the island to become the new Phuket Airport Director this Friday (June 9), an AoT official told The Phuket News. Great news that the director of Phuket International airport has been transferred. She didn't manage what she had to manage, and what she 'managed' was just ordering around. I remember her statement with the promised draconic punishments ( even death penalty) if you would walk at the beach on public land in front of the airport runway. The general manager of Don Muang? I Don't think this is a step up. Looking at the state of that place.